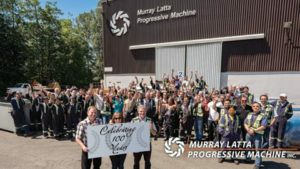 Murray Latta Progressive Machine is celebrating a milestone in 2018: 100 years as a successful machine manufacturing and distribution business. The current business was formed by a merger of Progressive Mill Supplies (est. 1954) and Murray-Latta Machine (est.1918) after working together for more than 50 years. With the recent addition of Brunette Machinery Company, the firm has expanded its forest industry presence even further by adding Brunette products and its 70+ years of machine building experience. Since 1954, Murray Latta Progressive Machine has been a trusted manufacturer and distributor of planer mill equipment, parts and consumables. “For all these years our technical knowledge, pride in workmanship and dedication to excellent customer service have been our highest priority because this is the key to our longevity,” says a company statement on the 100th anniversary. Sales and integration of planer and wood waste processing equipment. Planer equipment upgrades to increase productivity, quality and safety. Pro Edge-Tec III – Fully automatic planer cutter head knife grinder. Highest quality planer replacement parts and consumables. In-house equipment refurbishment and component repair services. On site installation, maintenance and training. You can follow the 100th year celebration on the company’s website.